Seriously Magical environment here. 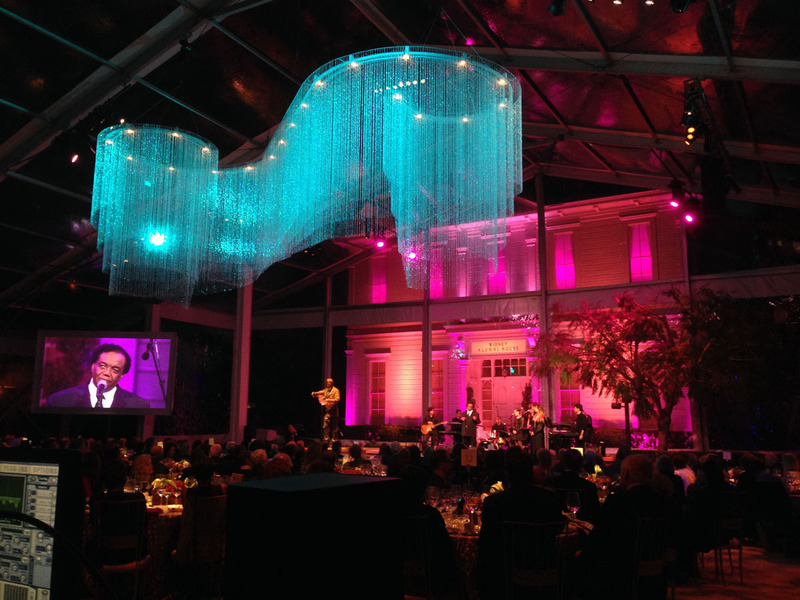 This was a great example of an event where the gig looked better than the renderings. This photo really doesn't do it justice but it's all I got. 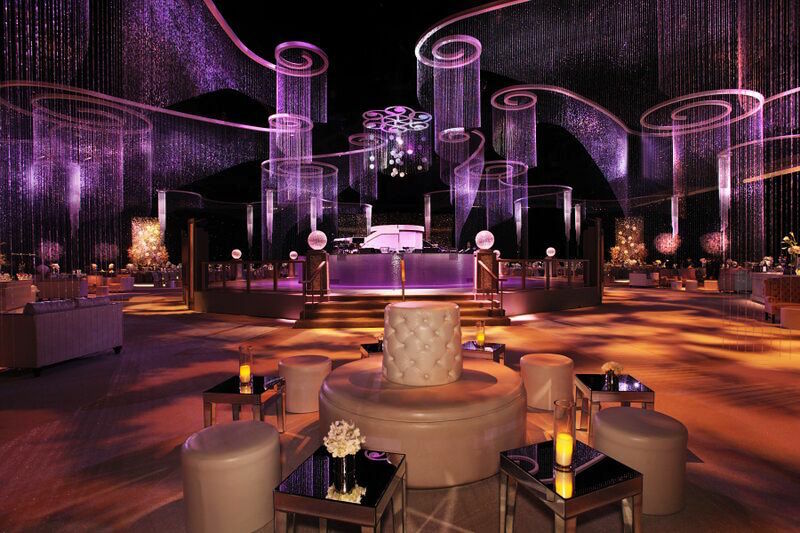 Cheryl and Andrea and the Sequoia team designed this dream-land experience with crystals and shimmer and champagne. Such a cool place to hang out. This was a little bash for 5,000 across the street from the Microsoft Theater for the 2015 Primetime Emmy Awards. A bunch of happy winners and a whole lot more disappointed nominees-only. Oh well, we're not all fleeing war in Syria, so we'll keep our chins up. Shout Out to Matt Levesque for stellar lighting design. Another day, another Pharrel hit. This time it's the new Adidas Superstar line of sneakers where those-we-follow designed righteous looks for the classic Shelltoe. Got to hang with another super cool creative collective from Portland called Kamp Grizzly on this one. Happening producers with happening clients - that's all we ask for. 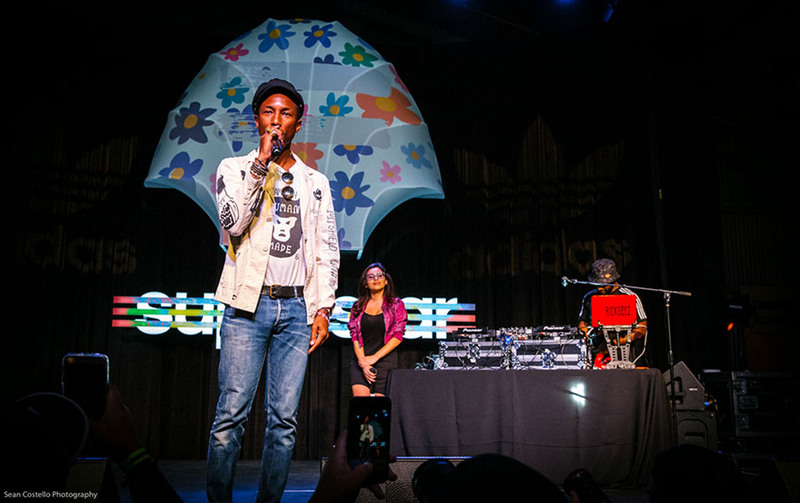 On this show Adidas invited 200 kids to come in and design their own sneakers. These designs were then projected on to a giant Shelltoe prop as you can see in the picture. All of this madness went down at Milk Studios in Hollywood, including performances by Pharell and Pusha T. Kickin it old school! 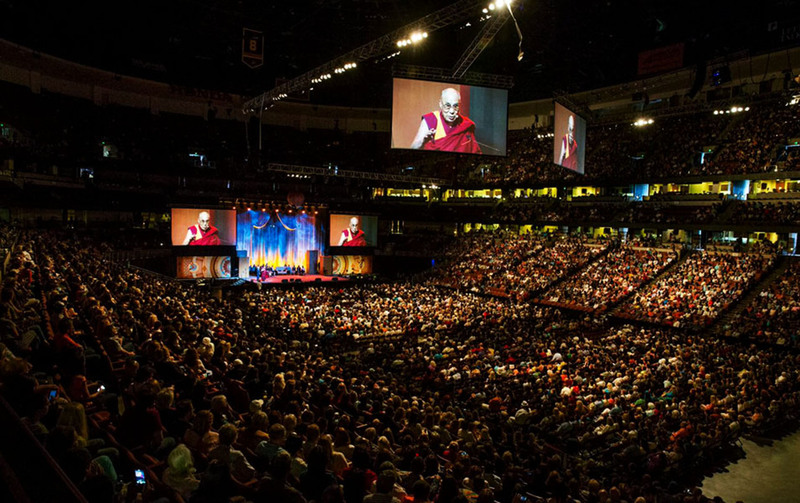 His Holiness the 14th Dalai Lama was honored for the occasion of his 80th birthday at a whole bunch of gigs around Orange County this week. Yeah, Ariadne at A-Team included us in all of em - sound, lighting, video. Seriously, thank you Ari - She brings us Snoop and Charli XCX and The Dalai Lama - who could ask for more? This picture is from the Honda Center - 18,000 people connecting with the DL's message of compassion and love and kindness. When our guys mic'ed him up, they felt it - this man pure. Give More Than You Take! June in LA means E3 to a lot of us. E3 means gaming, gaming, gaming. Do you realize the gaming industry has higher revenues than film, television and music combined? Hard to believe but it's true. That's why so many companies like ours are out of their minds in June every year. 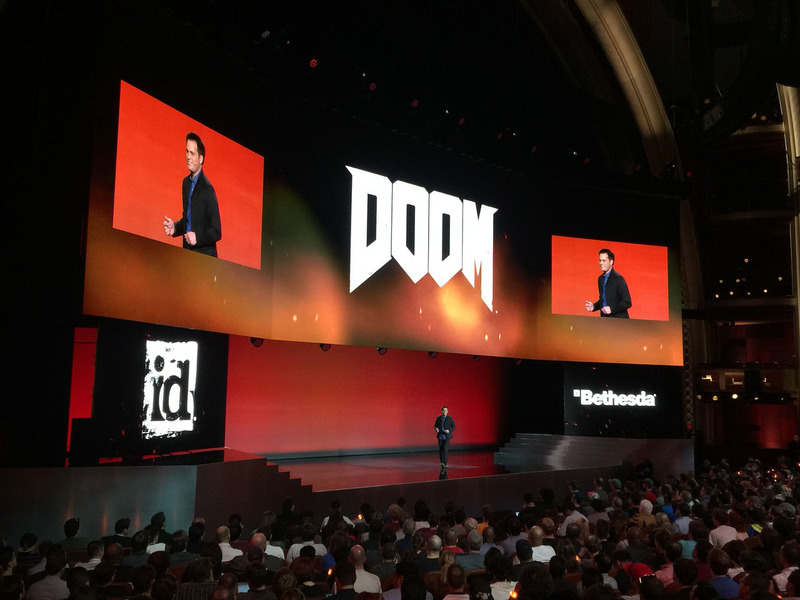 This was an especially good one for us because we took on a new client - Best Events brought us in to support their Bethesda show at the Dolby Theater. We provided close to 1,000 tiles of LED for this one. Loved working with Mel and Steven Sockey who produced for Jeffrey Best. It's a big world out there, and we're taking over one big gig at a time! Not really, but we're trying. We brought Lighting Designer Matt Levesque in to do the design for our FCC LED install a few years ago and he repaid the favor by bringing us along to install a fully mapped LED wall and system on the Giant Wheel at the Irvine Spectrum. Sick project - we used RGB and CK LED pucks to make a circular video wall inside the ferris wheel, then similar product to light up the "sun points" outside of the wall. Heck we even installed LEDs in the gondolas themselves so they became part of the programming. Slickest installation gag of the 20-teens is the gyroscope that controls the video playback on the wall. If you have a picture of your favorite fashion model on the wheel, and the wheel starts to turn, you sure don't want her image to turn too. So this gyroscope tells the Hippos exactly how to rotate the image to compensate for the wheel spining. Smart MF'ers at RBG figured that one out - All hail. 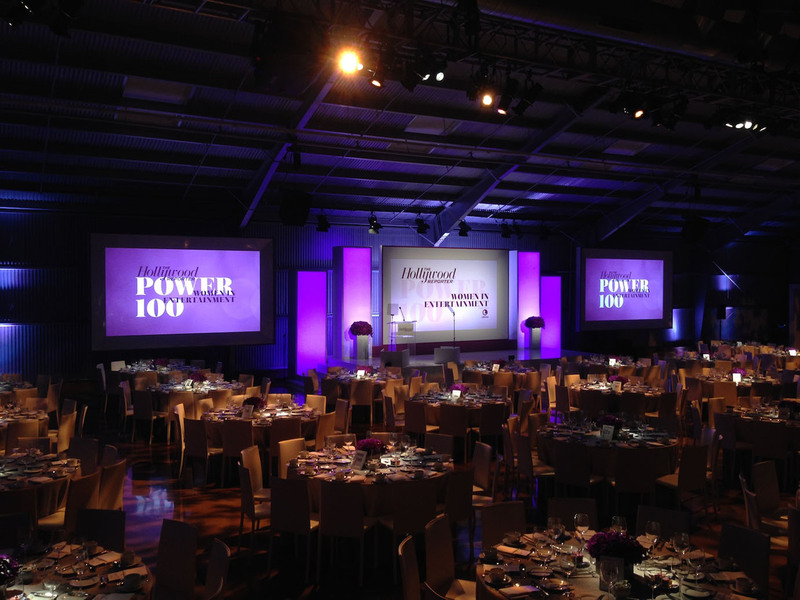 Big thanks to Bob and the Irvine Company for awarding the job to ShowPro, too. New friends and colleagues YLS Entertainment invited us up to the Thomas and Mack arena in Las Vegas for the FEI World Cup. What does FEI stand for? No idea, but apparently it's the greatest horses and riders in the world of jumping and dressage. So many amazing things to do in this life... Bottom line is we and YLS certainly know how to rock an arena, so that we did. Full lighting system for the dirt and audience, and a stage that dropped in from the roof. YLS did the big, cool lasers. 10 days in Vegas - thank goodness it was with good pals, because that has the potential to hurt. Full on Double Entry for March - Back to back nights with the Queen of Pop and the Prince of Shizzle. David Rodgers and Epix had us along to celebrate Katy Perry's new live concert movie. Sorry haters, she's wicked talented. Then straight off of his Keynote address at SXSW the Lion himself Snoop Dogg did a private listening event for his new Pharrell-produced Album BUSH. Ariadne at A-Team brought this one to us - possibly the greatest new client we got... Love her - Next up with Ari is the Dalai Lama's 80th Birthday at the Honda Center for 15,000 of his closet friends - yes, she has cool gigs. And yes South By Southwest was as great as ever - would do a post of The Oh Sees or Speedy Ortiz or something, but couldn't pass up the opportunity to mash double D with double G. thank you for indulging me. It's our favorite week of the year, remember? And it keeps coming around quicker and quicker I have to say. This is the Recording Academy's 5000 person Grammy after-party at the convention center that we've done now for 15 years. Between us and ATK and ACD and Kish and Eggs and Bacon, we've become a seriously well-oiled machine. The picture is of a big truss structure that Damon designed to look like a train station. Next door, Bob Dylan was honored as person of the year with the usual mix of legendary rock stars performing his songs. This stuff never gets old, and we feel crazy lucky to be involved. And yes all of us at ShowPro were thrilled to see Ryan Adams nominated for best rock album. We went up to San Fransisco with Sequoia to open up a new $1.5b medical facility in the Mission District, for UCSF. Bart Kresa designed an other-worldly interactive projection that towered above a massive stage. Breathtaking choreography from Alonza King Lines Ballet paired dancers and low-lying fog with Bart's projection for a really strong multimedia opening for the show. Kevin Spacey came out and performed standards with his band and the evening closed with Tim McGraw bringing down the house. All in all a very satisfying weekend between this great show, the inspirational new facility that is now open, and the Patriots pulling off a sweet playoff victory against the Ravens. 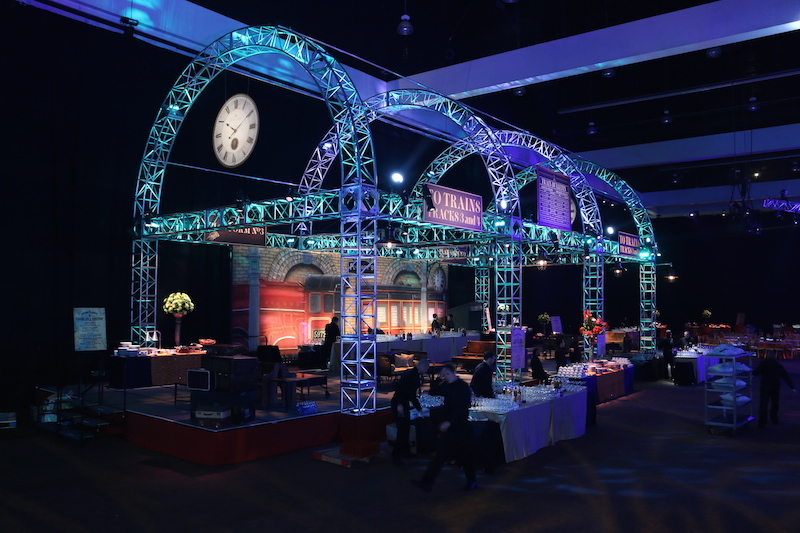 Great honor for us to work with a new client who has been a powerhouse in the event industry for many years, Caravents (where've you been all our lives, Cara?). Michael Escobar from Cara brought us on board to help out with sound, lighting and video for the hard-hitting industry event, Women In Entertainment. This is a great charity where women leaders from the entertainment industry mentor and sponsor at-risk girls. These girls are given guidance and access to education and jobs that would otherwise seem impossible. I will admit I had a tear in my eye when Angelina Jolie presented one of the girls with a full-ride scholarship to Loyola Marymount University. Ellen giving away iPods away is cool, but it ain't a college education. Massive gratitude to Caravents and Sean from Lone Outpost for including us. We were invited back to USC to help out with a big Alumni fundraiser. This time we were asked to provide all production - sound, lighting and video. Headlining was Lamont Dozier who was part of the legendary songwriting team of Holland-Dozier-Holland who basically penned every Motown hit you've ever heard. Almost. Lamont was backed by ridiculously talented USC School of Popular Music players, and they did all the hits. So fun to see the youngest and newest talent performing with a living legend. What a joy for us to be involved with the music, and to be handed the reigns on all production from Adam and Meghan from USC. Note the gig was in a clear tent, and that house-backdrop is outside of the tent. Super cool looking gig. Great Chandelier, too, right?